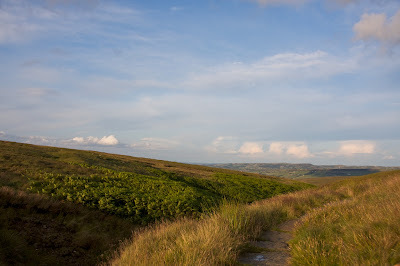 I was still a bit down about not having the opportunity to get out and have a walk and take some photos for the weekend in a row so on Friday evening I packed up my kit, got the dog and set off to Black Hill. It was a fine evening and the few clouds from earlier where parting to become a clearing sky so I thought I might get some nice sunset photos from high on the Pennines. It's a good hours walk from the road to Black Hill along the Pennine Way so we set off at a brisk pace. After the second stream crossing there were some nice fluffy clouds in the sky so I got my camera out to take a few quick snaps before starting the big ascent. 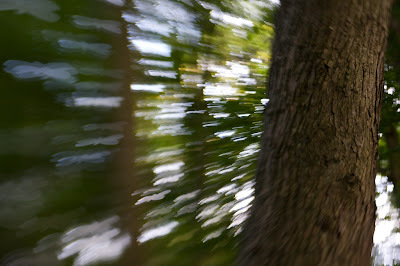 I put the camera to my eye and tried to move the zoom to frame the shot but it was stuck. I'd noticed before it sometimes was a bit sticky but this time it would just not move past 24mm. I tried a bit more pressure but nothing. 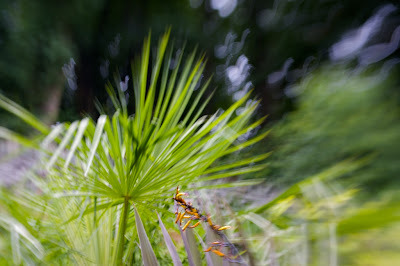 I removed the lens from the camera a noticed a rattling noise, shook the lens and sure enough it rattled some more. My first thoughts "Oh no, my main walkabout lens (17-85mm) is broken and I'm going on holiday in less than 3 weeks!!". My feeling of being a bit down turned into a deep depression in a matter of seconds. There's no way I can get the lens sent away and repaired in less than 3 weeks what can I do? I fiddle about with it a bit more but a knew that the tell-tale rattle spelled disaster. I put the lens back on the camera a and took a couple of shots, so I know the auto focus and image stabilisation was still working but the reduced zoom from 17mm to 24mm severely limited the usefulness of the lens. I could rent a lens for the holiday but that's dead money. I have been thinking of upgrading this lens anyway but that is very expensive (the 24-70mm L lens has a recommended price around £1,050). I felt very depressed and nearly turned around and just go back home and sulk. But I went on and took a couple more shots from my ex-lens before taking it off and putting on the 70-300mm from my bag. Not really a landscape lens but I also had my 50mm fixed focus and a 10-20mm very wide angle if anything good came up. The sky still had the fluffy clouds and a nice sunset was still looking promising. As we started up the ascent to Black Hill some dark clouds started coming over from the Manchester direction (typical) and it wasn't long before the sun was completely hidden. Took a few nice shots of the sun disappearing in the distance at 70mm. No more thoughts that we might get a nice sunset although I quite like the god rays in this shot. 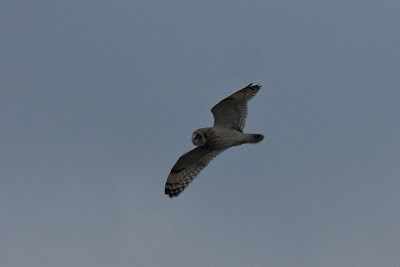 ... and then it turned away and flew back off towards it partner who was away in the distance. I watched them hunting in the distance for quite a while as we continued down the hill. 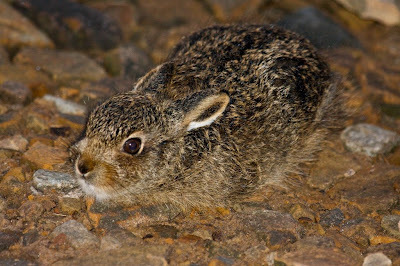 As we continued down the path I spotted this baby rabbit, just sat in the middle of the path, very, very still. I must admit I nearly didn't see it because it was getting very dingey. I fired off a few quick shots because I was expecting to run off at any second. I asked Evey to stay where she was, and surprisingly she did (I don't know whether she'd seen the rabbit, sometimes she's a bit dim). But it didn't run off so I crept around to one side for a few more shots. I was concerned that I was taking fairly long telephoto shots (around 200mm) at a very slow shutter speed of 1/15 of a second (even at ISO 800) and that the chances of many of them not being blurred was minimal (about 1 in 5 was usable, which I don't think is bad). So I turned on the on camera flash and hoped to get at least one good shot before the baby rabbit ran away. 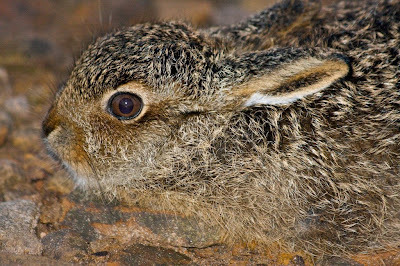 As it turned out the rabbit seemed to be unaffected by the flash so I continued to move around and get closer and zoom in more. I had to remove the red-eye in post processing but this shot is not cropped at all, so the definition in the full size image is amazing. I was so happy with this final shot that my depression was totally (but temporarily) gone. 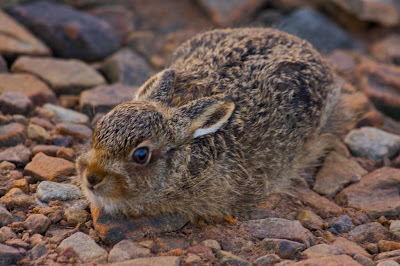 The baby rabbit finally scuttled off and we continued back to the car. A few more shots of the dark sky but nothing of note. Even tried to get a few shots of the distant street lights in Holmfirth with my Lensbaby but I think it was too far away to get anything decent. So it doesn't look like I'm going to get chance to go out on a photo taking trip again this weekend. My youngest daughter is getting the keys to her rented house on Saturday and so I'll be busy taking stuff over and assembling flat pack furniture. Although it does mean we'll be able to get into the dining room again. Following the success of the ducks (as seen in the previous entry) I've been making some more of my own creative apertures. I had thought of so many ideas and sketched them out but now I need to edit them down as I've only have 5 blanks. 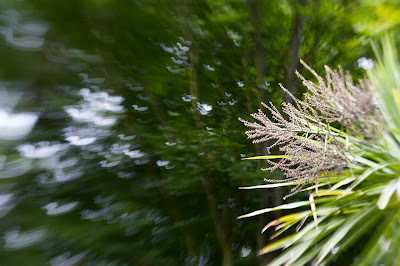 The results of the aperture making endeavours has been a bit inconsistent but overall I'm fairly happy. I think the trick is to keep the shapes simple but distinctive. 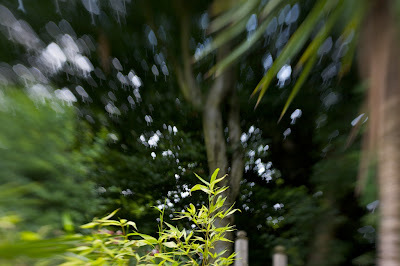 This first image is another from my study window where I'm using a tree shaped aperture. My daughter thought it was a mushroom (which was one of my other sketches) but I think it's quite clearly a tree. A mushroom would be much squatter with a thicker trunk and no roots. Although there are many varieties of mushroom so maybe I'll let her off. My next two attempts were a butterfly and a flower. I had real issues with both of these and I think it's just my inability to cut things symetrical or with regular shapes. I finally got the butterfly almost as I wanted but after keep cutting more and more bits of the aperture ring is now pretty flimsy. It was the same story with the flower and I'm not at all happy with the result which is why I haven't used it any of these images. The next photo is a butterfly one which isn't brilliant but I'll try to get a few more before the thing falls appart. 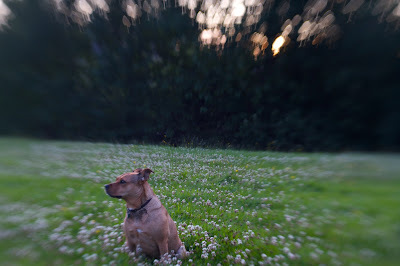 Tonight I've been for a walk with Evey dog and I used the tree (mushroom) aperture for this image. It was a bit dingey so I didn't manage to get Evey anywhere near in focus but I just like the different blues, pinks and oranges from the sun going down in the background behind the trees. I think this is an idea that I can use again and maybe make some better pictures. The next one was a few minutes later with a closer portrait of Evey. The problem is that quite often when she's out with me when I'm taking shots I'm always getting her to move out of the shot. So when I actually want to make an image of her she has a tendency to run off. The focus here is just slightly off to the right so her nose is a bit soft but again the colours of the lights coming through the trees are quite nice. 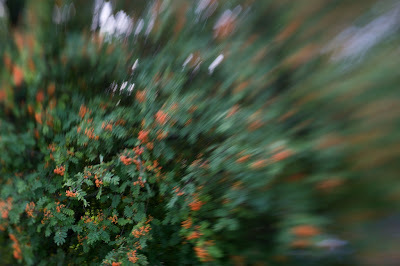 In the final shot I was trying to get these rowan berries to take on the tree shape. I think there maybe just a hint of it on the far right of the image but I think the problem is that the berries aren't single points of lightness and therefore making the bokeh far too blurred. I need to find a tree with with single berries or flowers. More experimenting is definitely required. So now I've just one more blank left. After going to see the new Harry Potter film on Tuesday night I was thinking maybe the shape of his scar? I'll have to order some more blank aperture rings because I've still got so many more ideas for shapes. OK, where's my link to Amazon? I've not managed to get out for a decent walk and photo taking session again this weekend. Saturday I was busy with other things (shopping mainly) and today it's only stopped raining for about an hour while I was out taking Evey dog for a walk and while I was without my camera. Oh well, I had a flying visit with my eldest daughter to return the dog and while there I picked up her craft knife and cutting board. 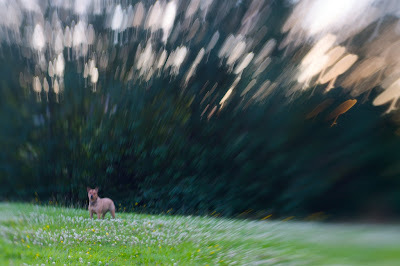 I was given the Lensbaby creative aperture kit for Fathers Day which has the star and heart shaped apertures plus 5 blanks. So I thought I'd have a go at cutting my own aperture. With the weather being so wet I decided to make a duck and here's a couple of photos from my study window. Now, what shall I make next? 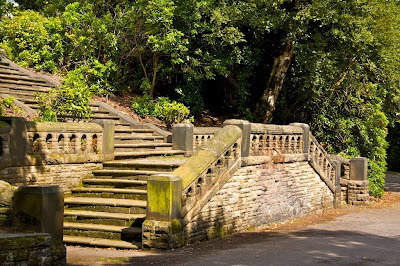 Beaumont Park was opened in 1883 and was the first public park in Huddersfield. The 20 acre woodland site was a gift to the Huddersfield Corporation from the wealthy landowner Henry Frederick Beaumont. Most of the park is on a very steep hillside and there are many paths and stairs that weave around the site. I have taken many photos of the magnificent stonework that is scattered around the park which include several bridges and areas for viewing the scenery across the valley. I had dropped my wife's car off to have the air conditioning recharged as it hadn't been coping to well with the recent hot weather. I was second in line at the garage so it was going to be a couple of hours. In the end it was four hours before I picked the car back up because they had run out of gas and had to fetch more from Bradford. Anyhow I had my camera bag in the car as I had intended going on a photo trip after the car was done but instead I had the morning to take photos around the area. So I ended up in Beaumont Park. I had been here several times before and so I was looking for something different to photograph. As I walked along the main path I noticed the water feature which appears to have had a recent refurbish and a fountain added (or repaired as I don't remember seeing it working before). This first image is a tonemapped HDR where I have held back on the processing so that it doesn't have that usual surreal appearance but looks quite normal. 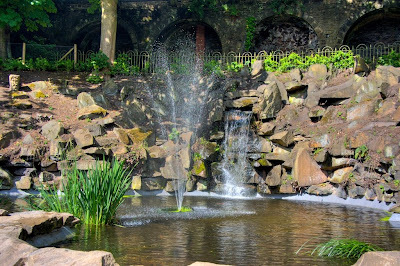 As it was quite sunny the fountain and the rocks were quite bright so in a normal shot the arches in the background were in deep shadow, whereas this HDR image shows quite a bit of detail. I thought that the water droplets in the fountain would be really good for making some more Lensbaby images with the creative apertures so I swapped over to the Lensbaby and looked around for a good foreground subject. There were some red flowers in a bed to the right of the water feature but the shots they I took here just didn't turn out right. 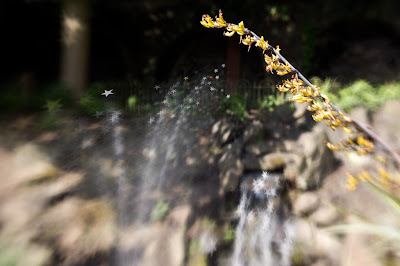 Then there was this flower stem which enabled me to get both the fountain and the waterfall sparkling in the background. I took a few more shots which also didn't turn out so well and then moved on. I might have to go back and try again because I felt there was more potential here to make some better images. I walked around the park a little more and then saw this staircase which I thought would make a good architectural shot. There were a couple of Crows and a Jay on the stairs which flew off as I approached. As I got closer I noticed that there where piles of nuts on each of the flat top stones in the staircase which ust be why the birds had been there. As I walked past the Jay came back and sat next to one of the piles of nuts. 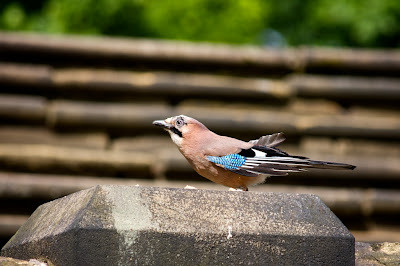 I quietly put on my telephoto zoom lens and tuned around to take a few quick shots of the Jay before it flew off again. I walked a little further on before I realised that I was heading back to the water feature so I turned around to head back again and find a different path. 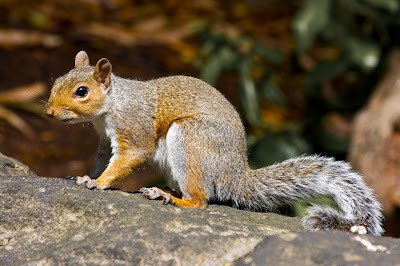 As I got close to the staircase again I saw that there was a couple of squirels after the piles of nuts now along with a couple of Jays and a crow. 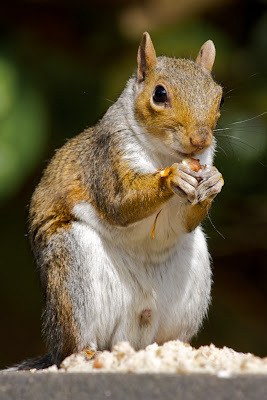 I quickly took a couple of shots of one of the squirels but they both had there back to me. I moved a little closer and the birds flew off (as usual) and one of the squirels disappeared. 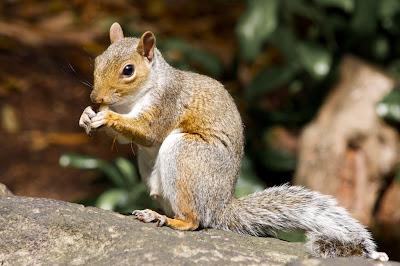 The other one seemed quite placid and I slowly walked in an arc around to a position where the squirel was facing me. It was stood up and allowed me to get close enough fo this shot. As I moved a little closer it decide to head up the side of the staircase but it had taken a nut with it and had stopped to have a bit of a nibble. When it had finished the nut it moved a little further up the wall but stopped for me to take this final portrait of it before it headed back into the woods. It's not a good morning so I've packed a cagoule and set off in search of more birds to photograph. There is an old road that goes from above Harden Moss down to Meltham that I've never been along before so I thought I'd scout it out. 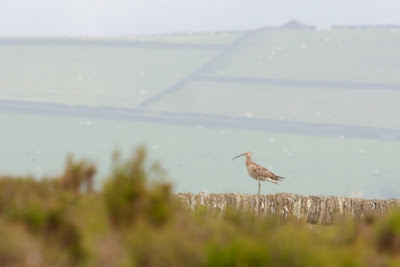 I've made some images of Curlew and Lapwing near here and I was hoping to see some today so I could practice my technique. I had brought my monopod to try and cut down on the camera shake in the shots and hopefully capture some reasonable images. 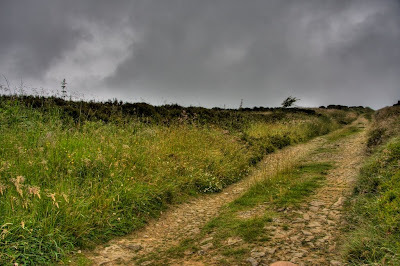 This first image is the start of the old road and shows it climbing gradually to the top of the moor. Many of the old roads in this area have never been properly surfaced and are mainly used by farm vehicles and horses. This one is in quite good condition and while I was here a few cross country cyclists went by. This is fairly obviously a tonemapped HDR which has made the sky look to have much more interest than it actually had. The image suffers a bit with haloing along the horizon which is something that the HDR software tends to add and I haven't found a good way to get rid of it as yet. On the verges of the road there were lots of spider webs covered with the water droplets from the earlier fog. 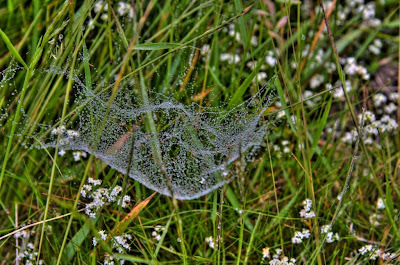 This is also a tonemapped HDR image of a web in the grass and the water makes it look like a miniature chandelier. 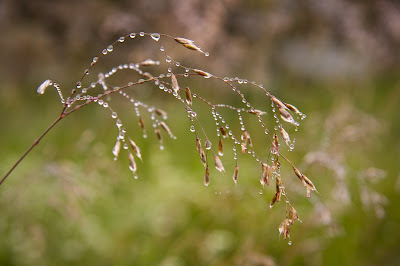 The grass was also covered in the dew and this next image shows a single grass seed head. The grass was waving about a bit in the light breeze which made it impossible to get a set of images to make into an HDR image. 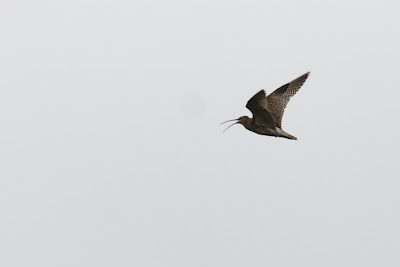 Then the first Curlew flew over and I shot a first set of images which turned out to be the best ones of the Curlews. The sun (not that you could see it) was behind me so the bird was quite well lit and I had remembered to overexpose the shot to stop the bird becoming a silhouette. The sky behind the bird was very bland and uninteresting but I was using today as a training mission. In a field next to the road there was a couple of Lapwing walking around among the sheep. I just managed to capture this one setting off to fly about. It's a pity that it was facing away from me otherwise this would have been a better shot. I left the road at the brow of the hill and headed towards an old quarry that I could see across a couple of fields. I thought there might be some more photo opportunities around there. 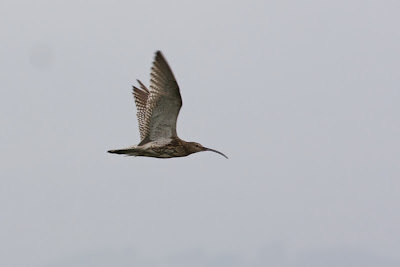 On the way the Curlew had come around again and this time it was making quite a lot of noise. This image shows it with its mouth wide open as it squawked. The Curlew swooped around and landed on a wall at the other side of the field that I was walking across. This image shows how misty it still was even though the fog had started to lift. You might just be able to pick out the sheep in the fields at the other side of the valley. When we reached the quarry (Evey dog was with me as usual) there was another pair of Lapwing flying around and swooping about. I'm not sure if they were trying to scare Evey away but a few times they got quite close to her. 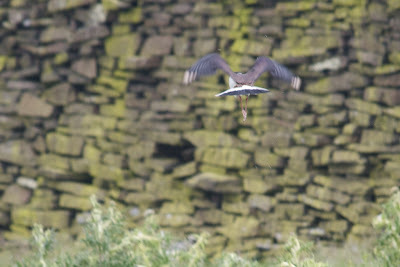 As it was still quite dull I put the ISO setting on my camera up to 800 so I could still use a fast shutter speed as the birds flew in front of the quarry walls. Unfortunately my camera insisted on focusing on the quarry rather than the birds so I ended up with several nice pictures of the quarry with a dark blur in front of it. 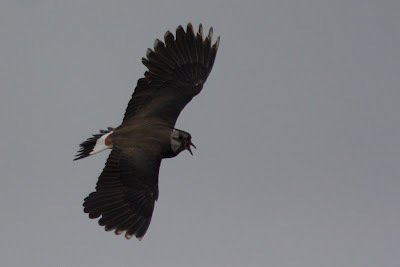 Eventually go a few decent shots of a Lapwing quite close but up in the sky. As I still had the ISO set to 800 (rather than 200 or 100) the shutter speed was a tiny 1/6400 of a second which got rid of any motion blur but left a lot of noise in the dark areas of the image. I've tried cleaning it up a bit so it doesn't look too bad now. I have been looking at this image for a few days now and I really like this bird. I love the way its wings are stretched out so wide and the angle that it was at when I took the shot. I can see it is calling with its mouth open and at full screen on my computer monitor it's possible to see its tiny tongue. 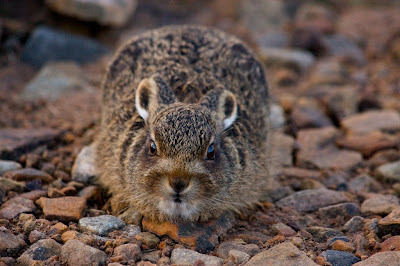 It has a splendid crest on the back of its head and even a hint of a catchlight in its eye. I heard another bird calling while we were in the quarry and at first I couldn't see where it was coming from. 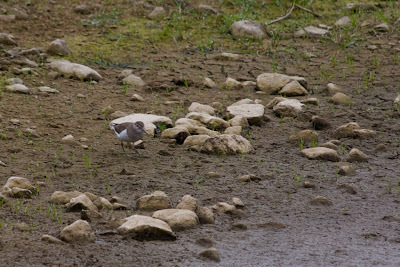 I walked towards a little pond in the quarry in the direction of the noise and then suddenly spotted this little Common Sandpiper running across the mud. 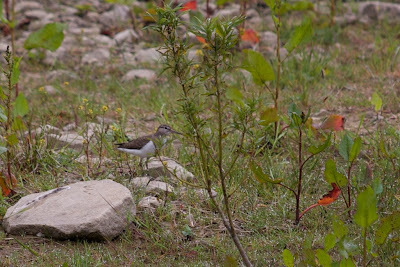 After a while the Sandpiper settled down in the weeds near the pond where I took this second shot. The bird is a little bit obscured by the weeds but I still like the image. I did take a lot more shots of the birds than I've mentioned here but I'm still not satisfied with how they are looking. I will return to this spot again when the weather is better and maybe if I don' have a dog with me and I sit quietly and hide, the birds may come a bit closer. 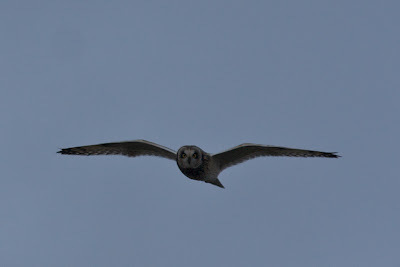 I'm still not thinking that I'll specialise is bird or nature photography but I'd still like to make some better shots.